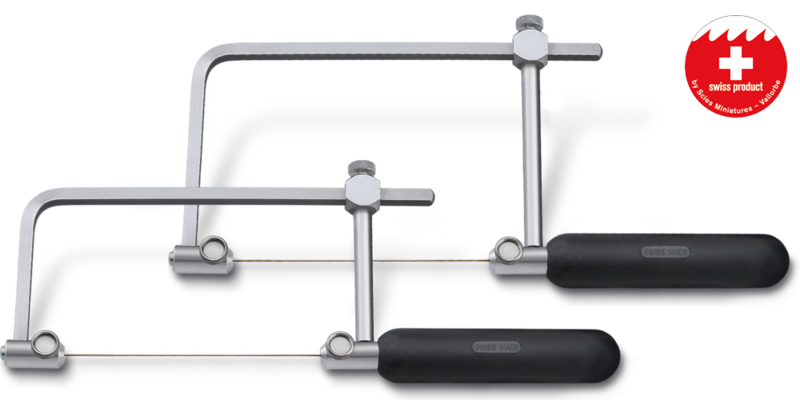 Revolutionary design in three lightweight, perfectly balanced saw frames. Ergonomic handles reduce fatigue and provide greater dexterity. Patented blade-lock design eases blade insertion, maintains perfect alignment and eliminates wobble which reduces blade loss during use. * Precision-made at our Swiss factory of the highest quality spring steel with non-glare finish. Set screws can be used on either the left or right side of the frame according to your preference. 2 3/4" (70 mm) deep. * Blade tightening screw must be opened wide enough to allow sawblades to be inserted all the way.